Meet "Trauma" & lots of pictures! Yesterday was a long day. It started at 5:30 with a doeling being born, and ended at 1am with twin kids being born. In between that, 2 sheep lambed and a 3rd doe had kids - twin doelings. The first kid that was born is named "Trauma", and there is a reason for that. We found her at 5:30am and she had just been born. I took her away from her mom (as usual with bottle kids) but we quickly noticed something was not right with her. Her neck was turned to one side and could not turn the other way. Long story short, she was not able to stand on her own or walk at all yesterday. I carried her almost everywhere with me. Good thing was that she had a great appetite and was very sweet ;). Today she can stand on her own and is even walking a few steps at a time, although she is still pretty wobbly. I gave her a shot of BoSe this morning, so I'm sure that helped some. And you might ask why her name is "Trauma"? Well, her mom's name is Drama Queen, so we figured this kid's name would be Drama's Trauma :). 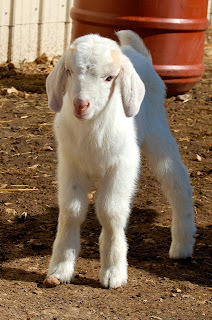 Nonetheless, this doeling is spoiled rotten right now. My little sister is a very much up-and-coming photographer. She takes almost all the pictures around here and does a great job at it (I think). It is a beautiful day out today, and an awesome day to take pictures. 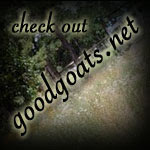 So, several of the baby goats had their photos taken. Here's a few from the bunch. Goat Town USA Powerhouse (name pending). Our future herd sire! He had a photo shoot this morning, here's a few from it ;). 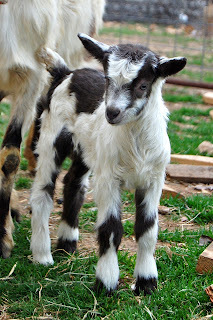 Last Friday I got a new bottle baby goat... after having 45+ of my own you wouldn't think I'd be excited to get another one. But. . . I was. This is a special one though. 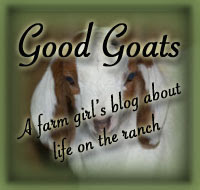 He came from Nicole's herd in Tahlequah - Goat Town USA. 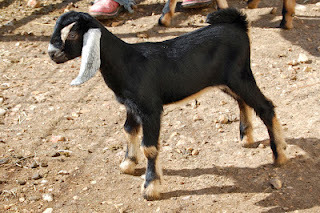 She has a small her of Nubians that she milks, but these goats aren't just any regular Nubian - these girls (& guy) are NICE, they come from some awesome Nubian bloodlines and you can tell. The sire to our new little guy is Pruitville's Challenger. He is just 13 months old now, is a very big boy and is so gentle. He is out of Pruitville's L/M Triumph and CH Pruitville's N/E Razzberry. 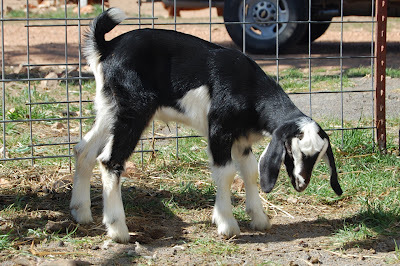 The dam to our new boy is Goat Town USA Hazel. She's a big beautiful 3 year old doe. Her sire is ANM Caprines Pepper, who I don't have pictures of but I did have the pleasure of meeting him in person a few years ago and he was a huge and very nice buck. Her dam is Paw-Paw Nicole's Ebony. And now to the one who this post is all about. . . I don't have a name for him yet!! I think it's going to be "Powerhouse", but it's not for sure yet ;). He is a very sweet boy and I hope he'll be a great herdsire for our Nubian does come breeding season this fall! I'm just taking a small step away from the ranch updates today and am posting this speech written by my 16 year old brother (all on his own, by the way). It truly is worth your time. Please take the time to read it. What if you lived in a country that was established on basic personal liberty and freedoms. And hundreds of years ago our fathers fought to their death for that country to be freed from their oppressors. What if they warned us of a government not guided by individual freedom and rights to liberty and told us how to avoid being enslaved by such a government. What if over the generations we slowly strayed from those instructions and now you realize how far from those rules our government has taken us. What if you realize you are being deceived by what is called common sense and you recognize that it is not evil to want your freedoms back. What if you realize tyrannical rulers are taking your money and only returning with more regulations on you and your countrymen. What if they printed paper and told us gold is not money. What if you realize that you have sacrificed your liberty for security and now you deserve neither. What if the people of this country have tried to convince themselves that killing their children is somehow morally correct. What if your leaders are truly supporting the murder of these helpless children and then they try to persuade you to support them. What if some of those rulers claim to be pro-life and then attempt to justify voting for the funding of murder. What if your president is lawless and has broken his oath, yet for some reason he is not being held accountable for his actions. What if we as a nation spend money we do not have bringing down rulers of other countries because they oppress their people and then you realize that your rulers are not far from the same. What if you are told that this is the way it must be and that our fore fathers were mistaken and did not understand how to keep this country free. What if we as a country wake from our sleep and put an end to the cries of helpless babies being murdered by the thousands with no one to save them. What if we wake and stop the killing of our soldiers in unending and worthless wars and we bring them home to protect this country that is called the Land of the Free and Home of the Brave. What if it is time to rise, be brave and not slumber to confront the tyranny and murder being forced upon us. Time to stand between the dead and the living. Time to say enough to the slaughter of precious little lives. Enough war. Enough greed. Enough oppression. Enough stripping of our liberties. Do you realize all these "what if's" are actually truly what is going on around you? For too long we have not heeded what our founders warned us of, they warned that "All tyranny needs to gain a foothold is for people of good conscience to remain silent". Neither have we heeded the words that "Commerce with all nations, alliance with none, should be our motto." It is time to change this lawless government. And now we are told that the only choices we have are men that sometimes say good things but their actions prove they support the murder of children, that they fear a free and armed people, they are greedy, support big corporations and bigger government and they do not follow their own laws which makes them lawless. Yet, there is one man who stands out from the rest. He thinks outside of the political "box", so much so that they think he is crazy. Is it wrong to promote following the constitution? Is it wrong to believe in peace? Is it wrong to advocate putting an end to nation building and policing the world? Is it wrong to speak out for the poor and needy? Is it wrong to say that any candidate but Ron Paul will pull this country further down the drain? It is time for the Ron Paul revolution. It is time to finally have a leader that understands and promotes peace, prosperity and freedom. Just a few kid pictures from a couple days ago! Kidding season is going very well. 17 does have kidded so far with 37 kids. All very healthy kids and I've only had to assist on a couple. 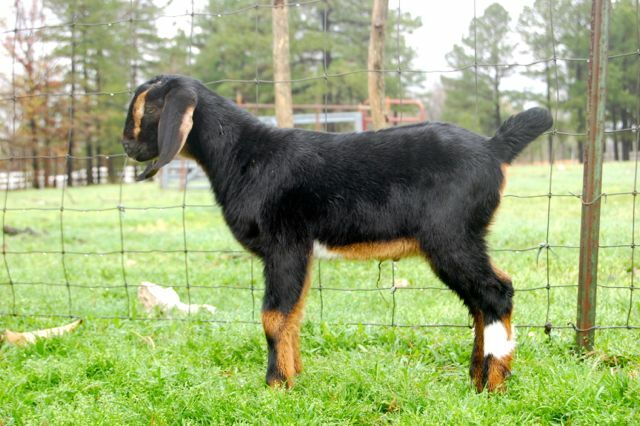 Below is our Purebred Nubian doeling we are keeping this year out of Pinckard's GL Hershey and Free-Spirit Rosemary. Haven't come up with a name for her yet, but she is very photogenic and a prissy little one. This is one of the Alpine doelings we are keeping. 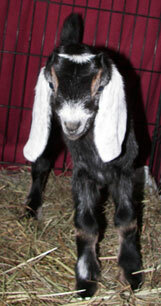 She is our of our American Alpine buck Good Goats Cadbury Doodoowee I and Journey. 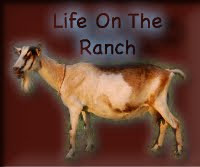 I don't think I've mentioned this on my blog, but we started a channel on YouTube called OklahomaRanchLife. We are filming a lot of the goat and sheep births. So, here is one of the videos and you can visit our channel to see more! Any feedback is welcome. kidding season in full swing! Kidding season is in full swing here! And it is going very very well. Since I last posted, 5 does more does have kidded, and there are several more due any day. Kind of a weird thing that is happening this year - typically all my does go on between day 146 and 150. Always been that way, no matter what breed they are. Well, this year things have changed. Almost every single doe has gone past her due date, and a good couple days past it. Most of them have been kidding on day 152 to 154. Only 2 have been the "exception", with them kidding on day 149 and 150. All the kids have been extremely healthy and robust, the does are in great shape and milking well, and there have been little to no kidding problems. I've only slightly assisted on 2 births out of 12, not bad, especially with them having GIANT kids - no joke. So, the only conclusion that I can come to is it means they are all very healthy this year?! Which I am very thankful for. I hope the rest of kidding season goes like this. The warm winter weather we've had could play a part but, who knows. I don't have any kid pictures on this computer - will have to put some up later. But, here's a rundown of what the last 5 does have kidded with. On February 29th, Good Goats Baby Ruth (Nubian doe, bred by Hershey our Nubian buck) kidded to a beautiful buckling and doeling. March 2nd, Shelby, our LARGE unregistered Alpine doe, kidded to triplets who are all massive kids. Their sire is Cadbury, our Alpine buck. We got home late and all 3 had just been born. 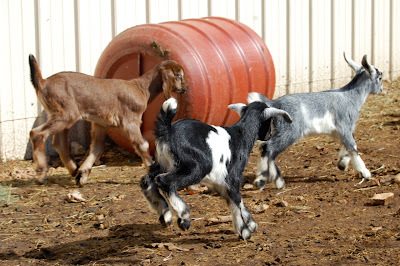 There are 2 bucklings and 1 doeling. Shelby is being an awesome, awesome milker. March 4th Lizzie, one of our Nubian/Alpine does, kidded to a giant, and I mean GIANT, single buckling. He needed just some slight assistance coming out since he was so large. 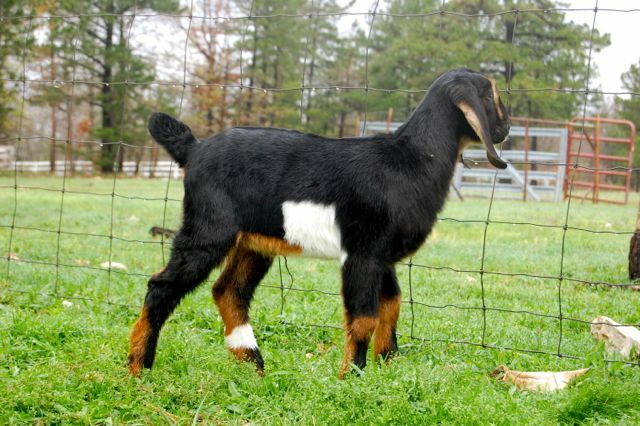 He was sired by our Nubian buck, Hershey. Early morning on March 5th, Helena, one of our Snubian does, kidded to a buckling and doeling out of Hershey. We found then right after they had been born. 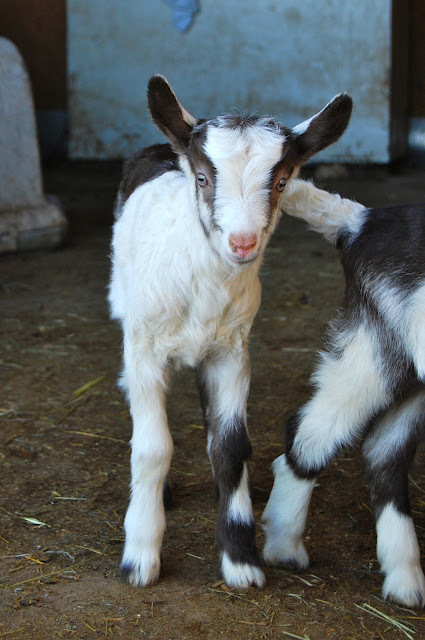 The buckling is pure white - just adorable, I think. Certainly will have to get some pictures of him up here. And last but not least, Journey, another one of our Alpine does, kidded to adorable buckling/doeling twins. They are so hairy, so cute! At 5:30am we found her with the buckling out. The doeling was born breach just a few minutes later. So, that's all for now! Right now I have one Alpine doe who is 3 days overdue - guess she just wants to follow the trend of things this year! 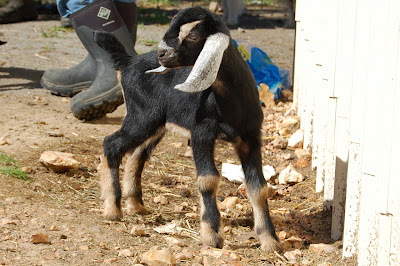 And tomorrow, the 9th, our "Grandma Goat" who is 12 years old, is due. . . crossing my fingers for an easy kidding for the old girl! Well, have a good day y'all!